Friday Night - We dined with my husband's parents at Kenichi in Victory Park. They must have fired their cleaning lady, because the dinning room in Kenichi was not clean. I noticed dirty drapes and piles of crumbs in the corners of the floors. Plus, I think their bar furniture was a bit tattered. The food was good, but it wasn't exceptional. I did enjoy the night with my husband's parents, but I don't think I'll return to Kenichi. Saturday Night - We dined with my parents at The Grape in Lakewood. The Grape is the most loved neighborhood restaurant in Dallas. Everyone loves that place. They serve delicious food, but their dinning room is the size of our living room, and it's out of my comfort zone to sit so closely next to strangers when you're paying top dollar for a meal. Since the food is so good I would return to The Grape and pay full price! Sunday Night - We dined with my buddy Dave and his girlfriend at Al Biernat's, which is in the fancy part of Dallas. Al Biernat's was amazing on every level. We were wowed by our dinning experience. I was hesitant to eat there because it's where all the cool kids like to eat, and by "cool kids" I mean both real and fake millionaires and both real and fake Dallas celebrities. 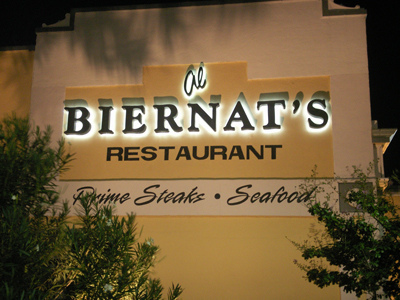 I cannot wait to find an excuse to return to Al Biernat's. You must go eat there!